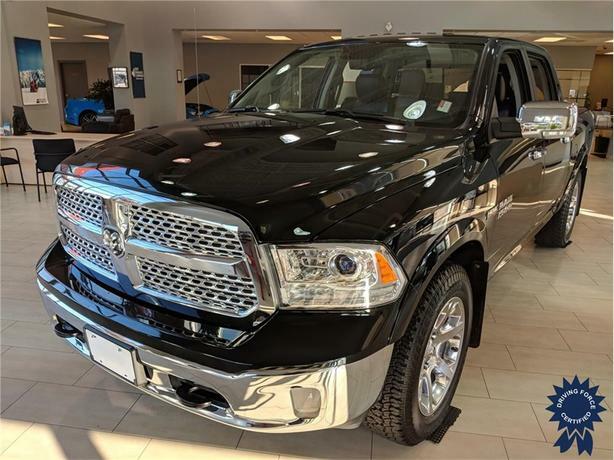 This 2017 Ram 1500 Laramie Crew Cab 5 Passenger 4X4 5.5-Foot Short Box Truck comes with a 140.5-inch wheelbase, 8-speed TorqueFlite automatic transmission, 3.92 rear axle ratio, anti-spin differential rear axle, electronic transfer case, towing with harness and trailer sway control, trailer brake control, Class IV trailer hitch receiver, locking lug nuts, spray-in bedliner, block heater, part and full-time four-wheel drive, 160-amp alternator, 121-litre fuel tank, Uconnect 8.4-inch SXM/Hands-Free/Navigation system, backup camera, front and rear all-weather floor mats, auto locking hubs, power windows, power door locks, front fog lamps, LED brakelights, front-frame mounted tow recovery hooks, heated leather steering wheel, three 12V DC power outlets, tire specific low tire pressure warning system, 20-inch wheels, leather seats, heated front seats, 98.4-litre fuel tank, 1,340 lbs Maximum Payload, and GVWR rating of 6,900 lbs (3,129 kgs). Touch base with us to discuss purchasing or financing options that are right for you and experience the difference you will only find at DRIVING FORCE Vehicle Rentals, Sales and Leasing. Special Note: The pumpkin shown in the photograph is not part of the advertised vehicle, and is not for sale.